Jet Black Peacock Matt 19x12mm Rectangular Pressed Czech Glass Bead. Coated intensely with coloured Peacock flowers and gently matted. 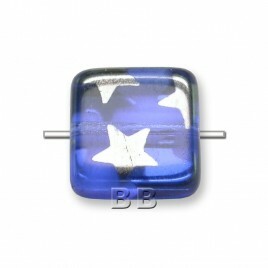 The glass bead is somewhat reminiscent of traditional Japanese fabrics; this is a very special glass bead. Stunning and Sophisticated! This pressed glass bead is ideal for sophisticated jewellery; bracelets, necklaces, earrings and hatpins also, it works well in garment embellishment, and a myriad of other uses.